Spend a day exploring the diverse landscape and fascinating culture of east Bali with a private local guide! You’ll visit spectacular wonders like the Tirta Gangga water palace, rice paddies and fruit plantations. This day trip showcases the best of Bali’s eastern coast, including lunch at a countryside restaurant and ancient traditions in the Aga village of Tenganan, away from the tourist crowds. Take an enthralling, in-depth look at East Bali’s multitude of wonders during this East Bali day tour. Set off for the East Bali day tour to the flanks of Mount Agung to visit Besakih temple. Commonly referred to as ‘the mother temple’, this is the island’s largest and most sacred site. Listen as the guide explains the intriguing history of this terraced temple and watch as local devotees donate offerings to the gods. 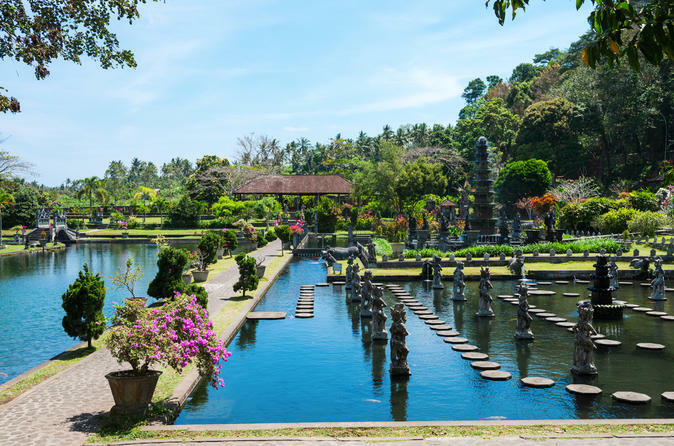 Continue with a visit to the regions sacred water palace, Tirta Gangga. Be captivated by the peaceful surroundings which includes decorative pools, lush plant life and fountains. The guide will explain how water plays a prominent role in the belief systems of Bali’s Hindu people making sites such as this important pilgrimage destinations. A traditional Balinese lunch is served in a countryside restaurant nearby. With a boost of energy following lunch, it is time to hit the trails for a soft two-hour trek. Pass through pristine landscapes, enjoying sweeping views of rice paddies, small villages and rolling hills. Stop often for photos or to chat with locals encountered along the way. At the end of the trail reach Tenganan, a village inhabited by the Bali Aga people. Take a stroll around the village to learn about the ways of life of these people who are direct descendants of Bali’s first inhabitants. See skilled artisans making baskets and weaving ikat textiles, appreciating the island’s deeply-rooted cultural traditions. Commence the drive back to the hotel, this time traveling along the scenic eastern coastal road. Soak up the views of this charming corner of Bali as the day tour comes to a close.